When I saw David Leite’s post and video about his Portuguese Orange Olive Oil Cake I knew I had to make it for Christmas dinner. (I know. Christmas was over 2 weeks ago. I couldn’t wait until Christmas 2010 to post this.) David insists that you must wait at least 24 hours before tasting the cake. That meant I could make it on Christmas Eve and have the dessert all ready for Christmas day. This cake is so delicious, and it really is easy to make. And it’s remarkable how well it keeps. I had one small piece left a week after Christmas and it was still wonderful! 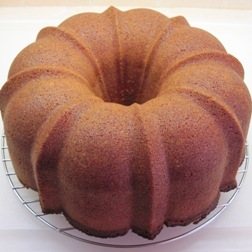 David cautions to use a light-colored Bundt pan because “a dark one will turn out a cake that sticks and is unpleasantly brown.” My Bundt pan is medium-colored and has a non-stick coating. It worked for me. As David says, don’t even think about tasting the cake for at least a day or two after you have made it! 1. Put an oven rack in the middle of the oven. Preheat the oven to 350˚. Spray a 12-cup Bundt or tube pan with baking spray. 2. Finely grate the zest of 3 of the oranges. (A Microplane zester works well for this.) Squeeze 4 of the oranges. If you don’t have 1 1/2 cups of juice (I didn’t), squeeze the 5th orange. 3. Whisk together the flour, baking powder, and salt in a large bowl. 4. In the bowl of a stand mixer, beat the eggs on medium-high speed until mixed well, about 1 minute. Slowly pour the granulated sugar in and beat until it is thick and pale yellow, about 3 minutes. On low speed, add about 1/3 of the flour mixture, then about half of the oil. Continue alternating, ending with the flour and beat until just a small amount of flour remains. Pour in the orange juice and zest and beat just for a few seconds to blend it all together. 5. Pour the batter into the prepared cake pan and bake until a tester comes out clean, about 1 1/4 hours. Check the cake as it’s baking. If the top seems to be getting too brown, cover it loosely with foil. 6. 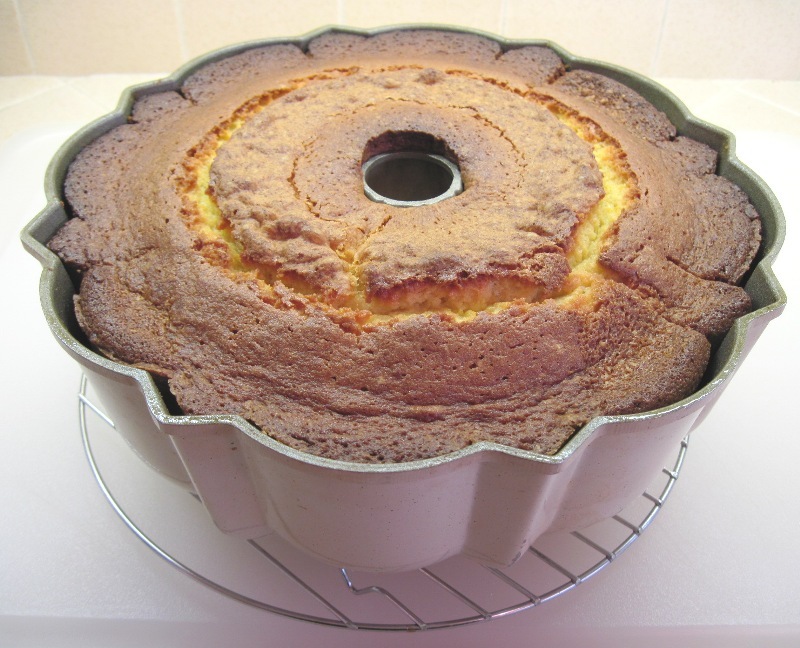 When the cake is done, put the cake pan on a wire rack to cool for 15 minutes. Then turn the cake out on a wire rack to cool completely. Put the cake in a covered cake stand and wait at least 1 day before eating. 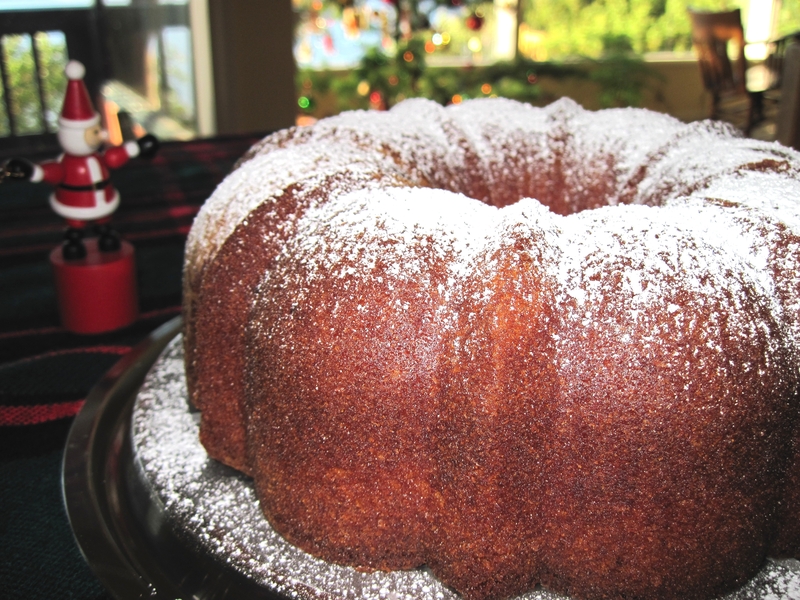 Just before serving, sprinkle confectioners’ sugar over the top. 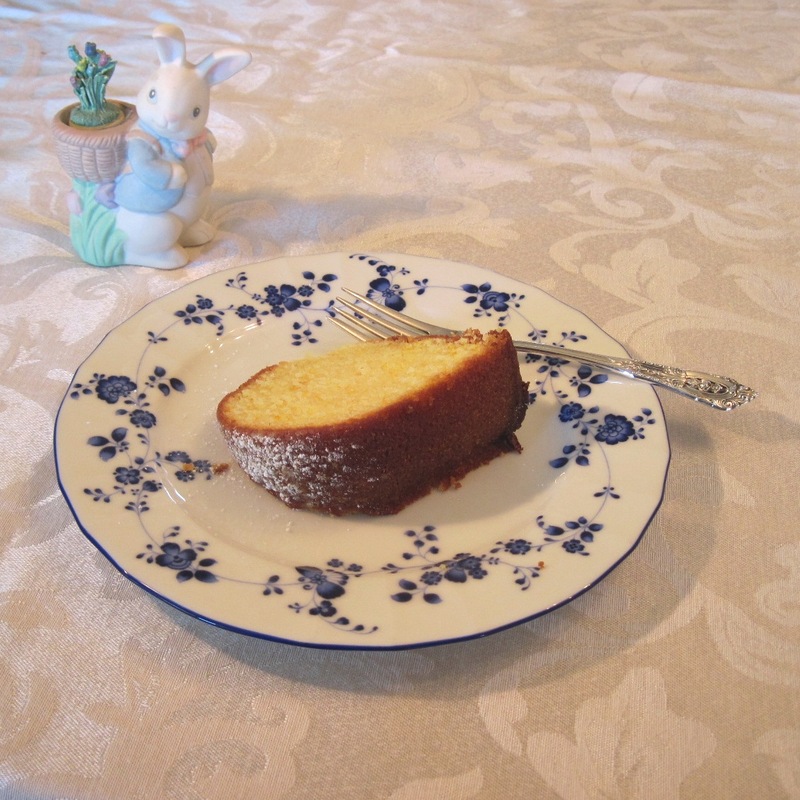 Portuguese Orange Olive Oil Cake revisited for Easter! I definitely nominate this as a holiday tradition- delicious! Thanks, Joan! It’s an amazing cake. I couldn’t believe that the last little piece was still good a week later. I’d vote for holiday tradition, too! And, you know, whenever the fancy strikes! Yeah, Laura, I’m already thinking that I’ll have to make this again–before Christmas! That looks amazing! I will have to keep that in mind for Anna’s birthday because she doesn’t like really sweet cakes, I think it would be up her ally. Hi Mary! For a cake that has 3 cups of sugar, it wasn’t overly sweet. I think Anna would like it! I’m so flattered you like my orange-olive oil cake. I hope you’re making it again this year. I just got through making four of them! I have an olive oil cake recipe but it’s quite different from this one. I totally love the orange in it! Need to bookmark and make it! This recipe is amazing, Sara! I love that you must make it a day or two ahead of time. And it is good, no not just good, it’s delicious for at least a week! David says it serves 10 – 12, but it easily serves up to 16. I think you’ll like it. I’m so excited about this recipe! Today’s experiment will be to substitute my mini Bundt pans for one large one. No doubt cooking time will change, but I’ll check appropriately. The goal is to have some mini cakes to gift on Boxing Day. Looks so perfectly moist. Love the flavors. Happy holidays! Beautiful cake! The combination of olive oil and citrus sounds wonderful! 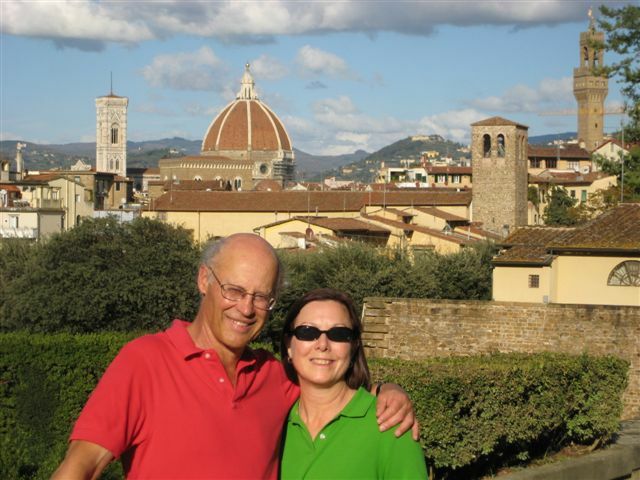 Thanks for sharing, and Merry Christmas! This cake sounds delicious! I’ve never heard of one like it; I need to spend the holidays with more Portugese people apparently. We are big fans of this cake over here! Looks perfect! The cake looks beautiful and I like the orange/olive oil combination. Yum!